Colombo, Dec 5: Yuvraj Singh has no qualms in conceding that he has been "failing" but the out-of-favour Indian cricketer says he won't give up on his career at least till 2019. The 36-year-old all-rounder, who played a pivotal role in India's 2011 World Cup triumph, has been struggling to keep a place in the side for some time now. "I would like to tell that I am failing. I still fail. I failed the last three fitness tests but yesterday I passed my fitness test. 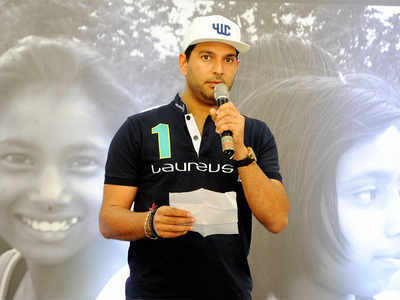 After 17 years I am still failing," Yuvraj said. Speaking at an interactive session organised by UNICEF here as part of 'The Power of Sports to Shape the Future of Adolescents' campaign, the veteran said his career decisions will be solely decided by him. "I am not afraid of failure. I have gone through ups and downs. I have seen defeat and that's what's the pillar of success. "To be a successful man, to be a successful person in your life, you need failure and you've got to be defeated. That will make you a stronger person and it will take you to the next level," he explained. Yuvraj said he is not quite sure how many people believe in him given his recent slump but he hasn't stopped believing in himself. "I am still playing. I don't know what format I am going to play. But I am pushing everyday as hard as I used to, may be harder than before because I am getting older. And I see myself playing cricket till 2019 and obviously take a call after that," he said. "So I still believe in myself. As I said I don't know how many people believe in me but I do believe in myself," Yuvraj added. The left-hander has played 40 Tests, 304 ODIs and 58 T20 Internationals in his 17-year-career scoring 1900, 8701 and 1177 runs across the respective formats. He had recently hit the headlines for skipping Ranji Trophy matches to train at the National Cricket Academy in Bengaluru. It was learnt that he did so to clear the 'Yo-Yo' fitness test, which he had failed in the past.